I don't have anything substantial for today -- except that I believe that we will win. So today's Thursday Things will be a compilation of #USMNT hype videos to get you pumped for today. You're welcome. "One Moment Does Not Define Us" - USA World Cup Hype Video 2014 from Ted Harrison on Vimeo. 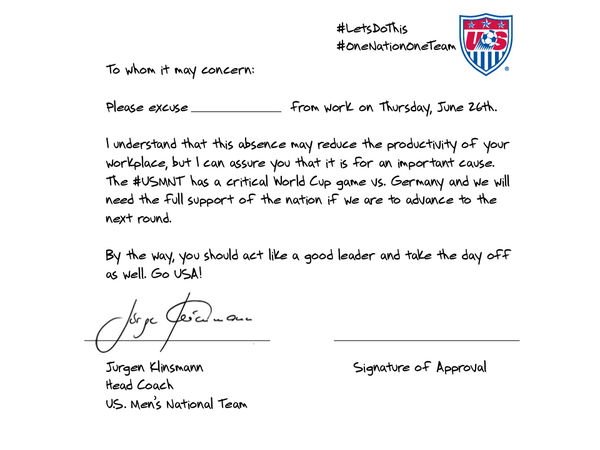 Don't forget, if you didn't already get the afternoon off, Klinsmann has a written excuse for you! If those don't get you pumped for the game today, you might be a robot.